On Wednesday, May 20th around 2:30 in the afternoon, I was feeding Samantha and the phone rang. It was the social worker from the adoption agency in Nevada and we were cleared to go home!! I called our social worker in Georgia just to double check and she said she was just about to call me – it was true! I finished feeding the baby while Chris and I jumped online to look at flights. We could leave at 10:40 that evening and get back to Georgia early Thursday morning, which gave us plenty of time to pack and get to the airport without having to rush. As soon as Sam finished her bottle, we packed, double- and triple- checked to make sure we weren’t leaving anything, showered and got dressed, dressed the baby and put her in the car seat. And she immediately projective spit all over her outfit and the seat LOL. So after a quick wardrobe change and seat-cleaning, we were ready to leave the condo before 6pm. We got to the airport around 6:30, checked in and checked our bags – then Samantha and I sat at Starbucks while Chris went to return the rental car (we didn’t want to try to ride the shuttle from the rental car place with all our luggage and the baby LOL). When he got back, we grabbed a bite to eat around 7 and bought a little stuffed monkey that said Las Vegas (and a keychain and Christmas ornament) for the baby, and got to our gate around 8. At almost boarding time, I put Samantha in her jammies and we got ready for the flight home. She slept the entire flight (I fed her while we were taking off and landing to keep her little ears from popping but she didn’t really wake up) – Chris and I did not sleep at all LOL. We landed a little after 5am (EST). over Georgia – she was happy to be home! taxiing to the gate in ATL! When we got home it was almost time for the house cleaner to get there so my mom stayed downstairs with the baby while Chris and I went upstairs (out of the cleaner’s way) and slept for a few hours while ganmommy and Samantha got to know one another. Later that afternoon my aunt, cousin, and cousin’s two kids came by shortly followed by Chris’s mom, aunt and uncle. Now we’ve been home a little over a week and have gotten into a nice routine of life with a new baby! 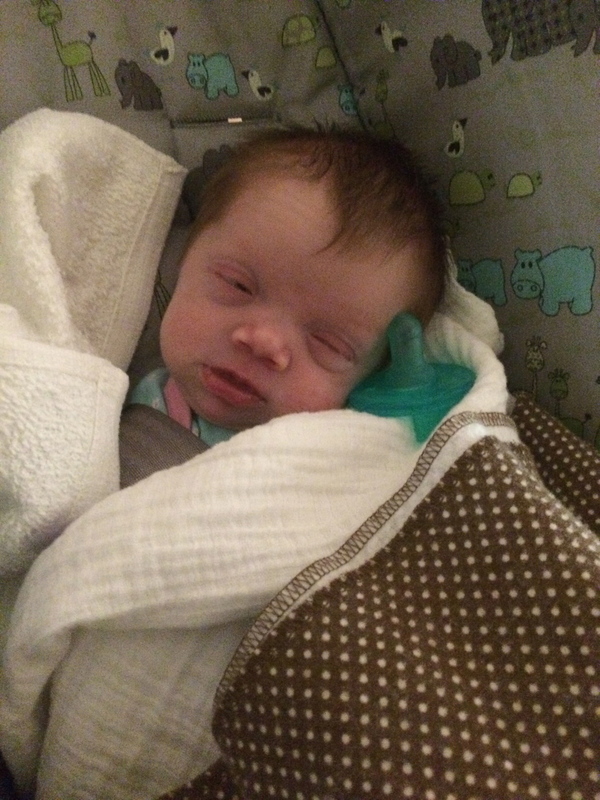 On May 14th, 2015 Samantha Jayne was discharged from the NICU and we got to bring her “home” to the condo that we are renting here in Nevada!! After the longest flight ever (it actually was less than 3 hours) we arrived in Las Vegas, drove to the hospital and got to meet our daughter a little after 8pm. 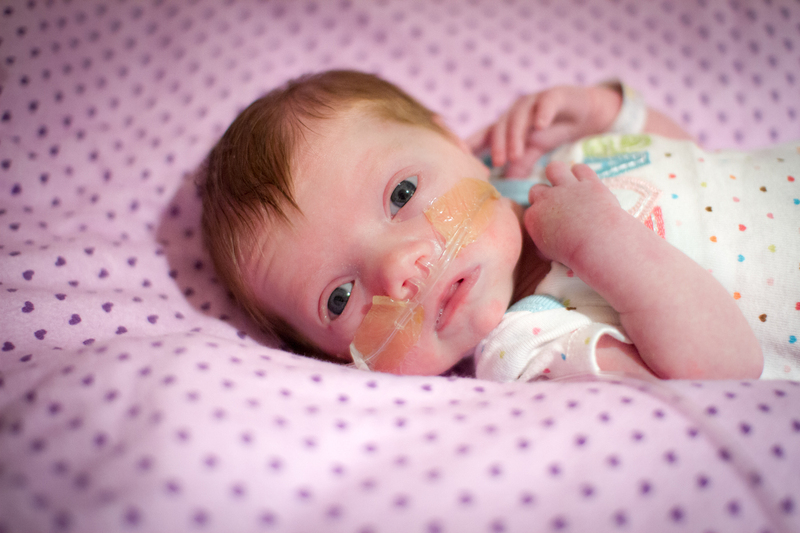 She was in the NICU and on oxygen. She had also had some bad diarrhea so she had a sore bottom – they had her diaper off and some air blowing on her little tiny hiney. At first they only let me and Chris go in and mom had to look through the window, but then the nurse felt bad for mama and let her come in for a bit. She had been born Saturday morning (May 2nd) at 6:22am, weighing 6 pounds and was 18.5 inches long. On Tuesday she weighed 5 pounds 13 oz. We got to feed her and snuggle her for a couple of hours and left the hospital around midnight. The nurse (Jo) was super-sweet and excited for us. Up until this point she had been on 21% oxygen (room air) with a 1 liter flow but her o2 saturation was dropping a lot so they had bumped her up a bit (I think she was on 25% then). According to the medical records they had sent us, she had been being gavage fed through a tube in her nose in addition to bottle feeding because she was having trouble coordinating her sucking/swallowing with the bottle. But when we got there the tube was out and the nurse said she had been doing better with the bottle. They made a name sign for her (all the other babies had pretty little hand-made signs on their beds but she didn’t since she didn’t have a name yet). Because we hadn’t eaten in over 14 hours, we left the hospital around 11 to go get something to eat (tacos at Don Tor Taco – they were edible). We went to the hotel and slept a little, then were back at the hospital at 8am Wednesday morning. Wednesday (May 6th) we got to talk to the doctor and found out that Samantha was probably going to be in the NICU about 10 days. We hung out with her for the whole morning, from 8 when we got there until about 10 when we left because we were supposed to meet with the social worker to sign our papers. But she called and rescheduled for 3:30pm – so we went to get some lunch (Marie Callender’s) and then I came back to the hospital. I took some onesies and blankets so that she would have her own stuff – I guess to sort of symbolize that she was no longer “baby girl” but now “Samantha Jayne” who had a family and people who loved her. Mama and Chris went to get our stuff out of the hotel and get everything moved into the condo we had rented for our time here. The doctor came by right around noon (Dr Ali Paroozi) and told me he was concerned about several things – a heart murmur, chromosome abnormalities, and why she was continuing to need oxygen (her oxygen saturation levels were dropping below 90% ). He ordered a bunch of tests which were done pretty quickly that afternoon. They did an ultrasound of her head and one of her chest and abdomen and also a chest/abdomen x-ray. We had to leave at 3:30 to go meet the social worker to sign papers (she had called and left a message moving it from 3:30 to 4) so we were hoping the doctor and cardiologist would get there before we had to leave, and they did. The cardiologist said she does have a tiny hole in her heart that should close within 6 months, apparently that’s not very uncommon in small babies, but otherwise her heart looked good. She also had a little fluid around her lungs that was probably causing the breathing problems – but we weren’t sure what was causing the fluid. The blood test showed metabolic acidosis, however. Dr Paroozi said no more formula, so they started an IV and gave her some bicarbonate. We left to go sign papers, which was much less of a big deal than I anticipated LOL but it was great to have everything official 🙂 After signing, we went back to check on our baby girl. Her oxygen saturation levels were looking good (she was still on oxygen though) and the bicarbonate seemed to be working. Since she wasn’t eating, we left to get some dinner (subway – yum) and ran to WalMart (also ran to Marshalls and Babies R Us looking for preemie gowns but couldn’t find any) and then came back and held her some more – but the nurse said she was getting too comfortable while we held her and falling into a deep sleep and would start breathing very shallow, then her O2 sat would start dropping. So we had to put her back in the bassinet. Since we couldn’t hold or feed her, we went back to the condo around 10 for a few hours of sleep again. Thursday (May 7th) we went back a little after shift change (8am) and she had done well overnight. They had run another blood gas and it came back good. She was down to 21% oxygen (room air) again. The doctor came by and said her head ultrasound was normal and the acidosis seemed to be corrected so he was going to let her eat 20ml at her 11:30 feed, 20ml at her 2:30 feed and then back to normal (40-60ml) at her 5:30 feed. I went back to the waiting room (sure is lucky that she is right by the window – I leave the blinds up a little so I can peek in at her from the waiting room) and worked a little on paperwork – Chris went downstairs to the lobby and worked and a little before 10 mom joined him (they kick us out of the waiting room at 10am every day because they have a class in there) and I went in to hold Samantha some more. She was getting very hungry – the nurse dipped her pacifier in a little bit of sugar water and she was going to town on it LOL. Because all of the other NICU parents were in the discharge class in the waiting room, they even broke the rule and let my mama in to hold her for a little bit. A little after 11 the nurse let me go ahead and give her the 20ml because she was so hungry – and she sucked it down in record time. Around 12 her 02 sat started dropping again so I put her down and went back to the waiting room. Mama and Chris went to get lunch (they had Carls Jr and brought me a milkshake – I wasn’t that hungry). We went back in a little after 2 and fed her again (just 20ml again) – this time I held her for almost 2 hours straight and it was heaven 🙂 Went back out to the waiting room around 4, then back in around 5. She was very excited to get her full bottle at 5:30 and ate 50+ml so the nurse took the IV out (left the port in but disconnected the iv) – exciting!! A little after 6 we left again and went to the condo for a nap, Chris picked up Checkers for dinner and we ate at the condo. I took a nap then a shower and we came back for her 11:30 feeding. Chris and mom went back to the condo to sleep and I stayed at the hospital. I fed her, held her a while, and went to the waiting room and slept on the little benches in there until 2:30 then changed/fed/held her and went back to sleep until 5:30 and then changed/fed/held her and went downstairs to meet mom and Chris for breakfast around 7. Saturday (May 9) After her 5:30 feeding I stayed with her until 6:22 when she officially turned one week old 🙂 Then I went downstairs for breakfast. Mom and Chris got there a little after 7 with Krispy Kreme donuts (even though I had already eaten bacon and grits, I managed to choke down the donuts LOL). We went up at 8 after shift change, changed/fed/held Samantha for a while (daddy swaddled her and fed her again). At 9:30 they shut down the NICU (i.e. kicked out the parents) because they had to do a procedure on a tiny baby so we went to the condo (did we eat lunch? Is this when we went to Wendy’s? I think I slept? Was this when the a/c guy came to fix the a/c in the condo?) It’s so sad that this was only two days ago and I can’t remember – I was so tired) then mom and I went back for the 2:30 feed and spent the afternoon at the hospital – by now we had a routine of hanging out in the waiting room watching her through the windows and then popping in for feedings and snuggles 🙂 I took the “real” camera in and did a very mini photoshoot (literally one pose). After the 5:30 feeding we went to eat at Arby’s, stopped at DQ for ice cream, and then went back to the condo again. Mom and I came back at 10ish to see if the nurses would let her sneak in and hold Samantha one last time but they wouldn’t so I gave her a quick snuggle and she said goodbye to ganmommy through the window. We went back to the condo and slept all night. Sunday (May 10) – My first Mother’s Day! We got up and took my mom the airport around 7:30 and got to the hospital around 8. Changed, fed and snuggled our girl, then I went to the waiting room and Chris went down to have some breakfast. Went back in around 10 and spent an hour+ (change/feed/snuggle and a mini photo shoot) then we went to In N Out Burger for lunch and to Target to get me a hoodie (I was freezing in the waiting room). 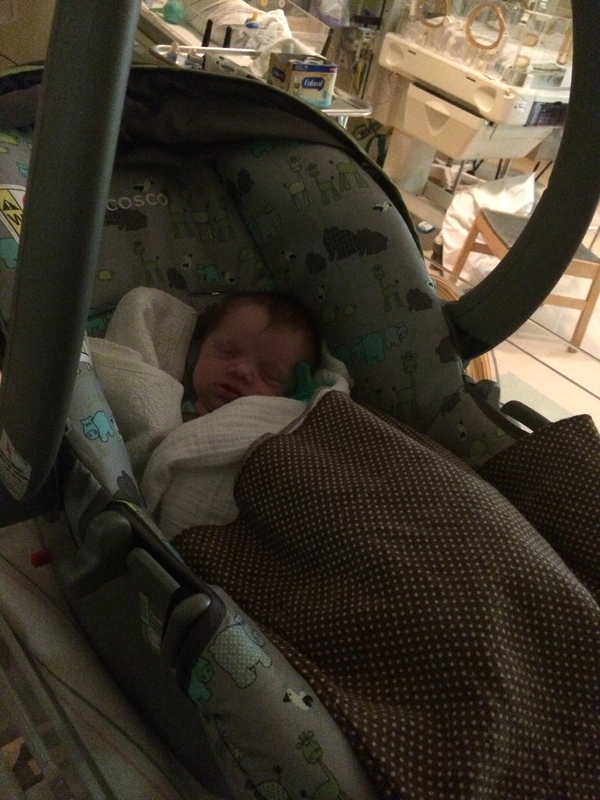 Back to the hospital, with Samantha for about an hour at each feed and in the waiting room the rest of the time. Chris left for a little while to go to the grocery store but I spent as much time snuggling my girl as I could for Mother’s Day 🙂 We left a little after 6 and stopped at subway to pick up dinner, then back to the condo to eat and then back to the hospital at 8. She was doing good so we fed her and snuggled some then went back to get another good night’s rest. 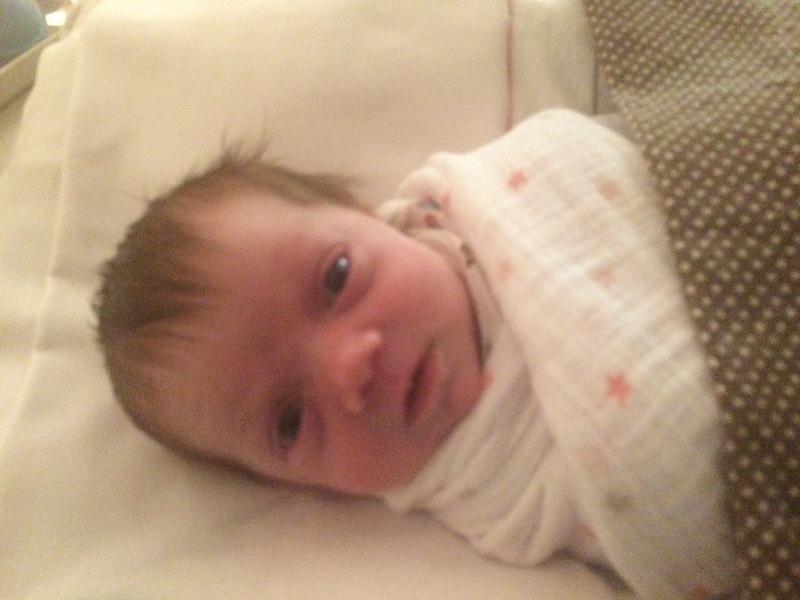 Monday (May 11) – I got up and came to the hospital for her 5:30am feeding and she was doing well. Came downstairs and worked on this blog post during shift change and went back up around 8 to find her oxygen cannula out!! Spent the morning with her (8:30 and 11:30 feeds). She had her hearing test and passed! A little after noon, I went to get Taco Bell and took it home to Chris for lunch. He came back to the hospital to do her 2:30 feed all by himself while I napped – the nurses said he did a great job 🙂 He came back to get me and we did the 5:30pm feed together – her sat levels are dropping a little but when I hold her she seems to breathe a little better. Came downstairs for dinner (eating in the cafeteria – I had frosted flakes and an ice cream snadwich LOL) at shift change and in an hour we can go back up to see her 🙂 Not sure if I will stay up here tonight or go get some sleep. I’m afraid the night nurse will put her back on oxygen and that will delay our discharge … Obviously I want her to be on the oxygen if she needs it, I just hope she doesn’t need it. Oh how I used to struggle with Mother’s Day. I honestly believe that my own mother is one of the best, if not the best, ever. On Mother’s Day I obviously wanted to honor her and how amazing she is. But for the last 10-12 years, Mother’s Day has also been excruciatingly painful for me. 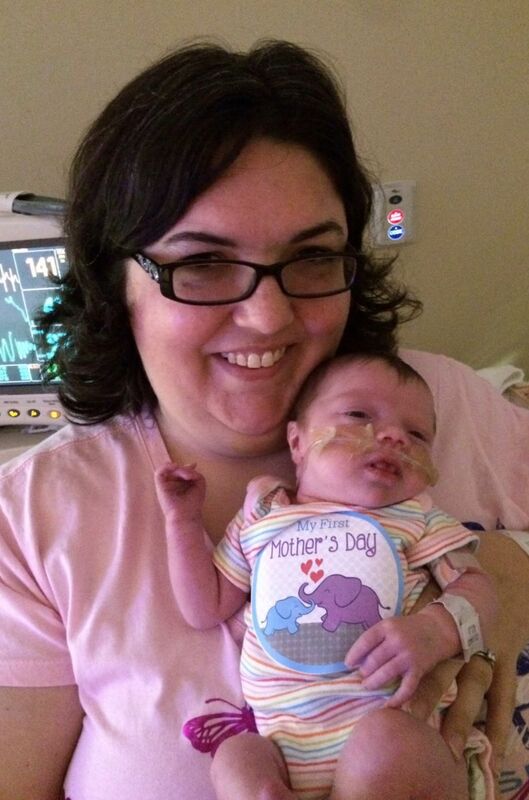 A month ago I was looking forward to this Mother’s Day so much – to spending it with Siobahn. Two weeks ago I was dreading it more than I’ve ever dreaded it before, after Siobahn’s adoption failed. I wondered how I’d make it through. But today? Today, I am finally a member of the club. I am doing what I feel I was always meant to do – snuggling my very own sweet little baby. She’s still in the NICU and has some wires and tubes coming off of her, and I can only hold her for certain lengths of time at certain times of the day, but I’m getting to hold her. And it is absolutely everything I ever dreamed it would be. Perfection. I miss sweet little Siobahn, and I hope she is doing well in her foster home. I miss the baby I miscarried but know he/she is in a better place. I miss my own mom, who flew home this morning. I miss my furry and feathery babies and can’t wait to get home to them and introduce them to Samantha. I miss my babies at school. I wish my grandmother who passed away when I was in high school and my grandmother who passed away before I ever got to meet her. I miss my mother in law who is at home in Georgia waiting to meet her newest granddaughter. I miss my grandmother-in-law and grandma-in-law who passed away. I wish I could celebrate Mother’s Day with all of the mother figures in my life and all of the people (and critters) who make me a mother. But I’m content for it to be just me and the precious angel who has made me a mommy at last, hanging out and soaking in each other’s love. I’ve never been a big fan of roller coasters – and I’m really not enjoying the emotional one I’m one right now. Last night (Sunday) we got a phone call from the adoption agency that there was a baby girl born Saturday morning in Nevada who will be available for adoption tomorrow (Tuesday). We all agreed (agency, Chris, myself) that we don’t want to travel until it is a done deal. In Nevada, TPR cannot be signed until 72 hours after birth so tomorrow morning that is scheduled to happen. If/when it happens they will contact us and we will be heading to Nevada tomorrow evening. I’m torn between excitement and terror. I slept less than 3 hours last night and am so anxious, exhausted, nervous, hopeful, and every other emotion you can probably think of. How do you cope with a failed adoption? When we miscarried, I found comfort in knowing that our baby was with God in a much better place. Our daughter (who wasn’t ever legally our daughter, but in our hearts she was) isn’t even with her mother now. She is in foster care for at least a year. So I have no idea who she is with or what kind of place she is in. I held this precious little girl in my arms, looked into her eyes, and promised her I was going to do everything within my power to make sure she was happy and taken care of for the rest of her life. Now I have no way to keep that promise. We knew going into this that it was a risk. We signed the contract and initialed the part saying basically that we understand that a baby is not *ours* until all of the legalities are taken care of. We knew, intellectually, that the mother of the child held all of the cards and could change everything at any time up until finalization. We thought we were prepared for that possibility. We started letting ourselves get our hopes up when our particular situation looked so promising. The estimated date of conception listed on the first page of medical records we received was listed as 8/20 – my birthday. We were told that the agency affiliated with the pregnant mother (let’s call her “Ann” for the sake of brevity) had the highest success rate of anyone. “Ann” is incarcerated and has no family, neither of the potential fathers wanted to raise the baby, so we were told the risk was extremely low that she would change her mind because she didn’t really have any other choice. She told us how she grew up in the foster care system and was abused, and that her experience was so horrible she could NEVER put a baby into the system. She had already placed one child for adoption a few years ago and felt wonderful about that decision – she told us many, many times how happy she was that she was able to bless someone who was unable to conceive with a child. Ann seemed firm in her decision. She even insisted that we be contacted and allowed to bond with the baby when she was born on Monday night. We allowed ourselves to call this baby our daughter when we met her because we truly believed, without a doubt, that she was. We found out Tuesday morning that the baby had been born Monday night and we immediately hit the road. It was about a 9 hour drive. When we got to the hospital, they brought the baby out to us. Told us we had a room and were going to be able to have the baby with us whenever the Ann allowed. We spent over an hour holding her, taking pictures, and falling in love. Then the nurse came in and sheepishly said that Ann wanted the baby back. She told the nurse that she would let the baby spend the night with us while she slept (it was a a little after 6pm at that point). Around 10pm we thought maybe the nurse had forgotten – so we asked if Ann was asleep yet, or if she knew when we would be getting to see the baby again. About an hour later they brought the baby to us again. Less than an hour after that the nurse was back – Ann wanted the baby with her again – told us we could see her in the morning. We said we completely understood!Red flag? Maybe in hindsight – but at the time we still had zero doubt. She was going to be transferred back to the jail in less than 48 hours … she had three days to spend with the baby, we had 18 years to look forward to – of course she wanted to spend as much time as she could with the baby now. All told we spent 2 hours on Tuesday with the baby who was, in our hearts, our daughter already. The baby we had named and spent the last two months falling in love with. I think I said thank you, then I hung up and my entire world fell apart around me. We called family, our pastor, friends … we cried and screamed … we prayed … I’m not sure exactly what else we did. We decided none of us (my mom was with us) was in any shape to drive home, so we packed up and decided to leave early the next morning to go back home. My mom, bless her heart, packed up all the baby stuff and loaded it into the car while Chris and I just stared at each other trying to figure out what to do next. The next day (Thursday) we drove home. My dad had the handyman come take the screen door down and replace it with the original door. He and my friend Ginny moved everything baby related into the nursery and closed the door. We got home and my mom put all the baby stuff we had taken with us in the nursery, too. Friday through Sunday are a blur. I remember my cousin coming to visit. I remember me and Chris taking the dogs to the park to get some fresh air and get out of the house. I don’t know what else we did. Monday I went back to work for a couple of hours in the afternoon. Tuesday was really rough because it was the one week anniversary of the best day of our lives and now we were well below rock bottom. That night I finally went into the nursery, curled up with a baby blanket in the rocking chair/glider and sobbed for hours. Wednesday we emailed the social worker and found out that the social worker hadn’t heard from her since the previous Wednesday in the hospital – and she said that if Ann decided now to place the baby for adoption it would go through CPS and not through her. So that door was slammed shut – and I fell apart. I had been holding out a little bit of hope that Ann would change her mind again and when that hope was taken away I had nothing left to stop me from drowning. Now it’s Sunday and I’m starting to heal. We have been presented with three additional opportunities but sadly, right now we can’t afford to go forward with them – even if we were emotionally ready to do so, which we aren’t sure if we are. I don’t want to let this derail us because I truly believe that we will be parents one day soon. However, I want to grieve this loss first. There is an important distinction between grieving the fact that we aren’t parents yet and grieving the loss of this particular, individual child that we held in our arms. She is irreplaceable. Yes, we will adopt a child but we will not miss this little girl any less – nor will we miss the baby we lost to miscarriage any less.